Starting as low as $.65 cents each! Print technology has advanced light years recently and now you can have almost anything printed online within minutes. PGprint.com is happy to offer our online printing services for your personal or business needs. Just use our online design generator on the right by clicking “Design Your Own” to get started. Our online flyer printing service is easy to use and we are always here to help if you have questions or concerns. We want to make sure your print project goes how you envision it. Be sure to use our layout guides to ensure your ÃÂ¯ÃÂ¬ÃÂle(s) is set up correctly for best printing results. CMYK is preferred and recommended. If you upload your ÃÂ¯ÃÂ¬ÃÂle in RGB color mode it will be converted to CMYK and the ÃÂ¯ÃÂ¬ÃÂnal product could end up differently than expected. Creativity shouldnÃÂ¢ÃÂÃÂt have limits, but there are some ÃÂ¯ÃÂ¬ÃÂle setup guidelines that should be observed when preparing your ÃÂ¯ÃÂ¬ÃÂle for print. Text and other design elements that you donÃÂ¢ÃÂÃÂt want to get trimmed in ÃÂ¯ÃÂ¬ÃÂnal production should stay within this area. 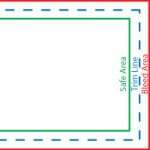 The safe area is minimally 1/8″ from the Trim Line. This is where the ÃÂ¯ÃÂ¬ÃÂnished product will be cut for its ÃÂ¯ÃÂ¬ÃÂnal size. This is the area that is going to be cut off in ÃÂ¯ÃÂ¬ÃÂnal production. Make sure this area is ÃÂ¯ÃÂ¬ÃÂlled with background image and/or color so there is no white space left when it is trimmed.